Yesterday a friend of ours was released from the hospital following an emergency appendectomy. Doctors orders require her to eat soft & bland foods for a week, while her system gets back to normal. I decided to make her some rice pudding, but as I started to pull my normal ingredients together, I found I didn't have everything I needed. 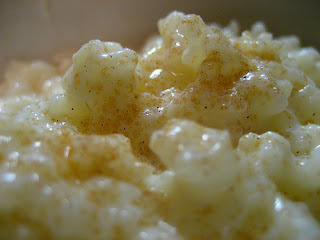 Necessity being the mother of invention, I grabbed what I found in the pantry and came up with a new twist on the basic rice pudding. I used less cinnamon and no raisins this time, because my friend doesn't need anything that might be difficult to digest for awhile. The results were better than expected and I may never go back to my old recipe. I decided I had to write this recipe down so I can remember how to do it next time. Give it a try. I think you'll enjoy it for a change up. Update: 16-April-2013 - This was so good, I decided to make it again for friends we invited for lunch. This time I modified the recipe a bit and I think the new variation is even better than my original. See below for both recipes. Cook the rice in the boiling water on a low simmer for 15 minutes and turn it off with the lid on. While the rice is cooking, use a large sauce pan and mix together the condensed milk, powdered milk, sugar, regular milk and Piña Colada mix. Bring the mixture to a boil over medium hear, stirring frequently so the milk does not scorch. Add the stick of butter and cinnamon until the butter is melted, then add the cooked rice. Bring everything back to a low boil and stir constantly for about 15 minutes until the pudding starts to thicken and the rice absorbs the liquid. Serve warm, or cold, with a sprinkling of cinnamon on top. Cook the rice in the boiling water on a low simmer for 15 minutes and turn it off with the lid on. While the rice is cooking, use a large sauce pan and mix together the condensed milk, evaporated milk, sugar, regular milk and coconut cream. Bring the mixture to a boil over medium hear, stirring frequently so the milk does not scorch. Add the stick of butter and cinnamon until the butter is melted, then add the pineapple pulp and cooked rice. Bring everything back to a low boil and stir constantly for about 15 minutes until the pudding starts to thicken and the rice absorbs the liquid.